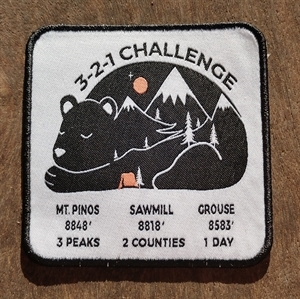 Celebrate conquering the 3-2-1 Hiking Challenge: 3 Peaks and 2 Counties in 1 Day with this commemorative patch! Measuring 3" x 3" square, this patch will remind you of the beautiful 11 mile hike you made in the southern Los Padres National Forest. It features a raised embroidered border and iron-on backing. Important Info: This item is shipped after you have emailed your photos at all 3 summits to the Mountain Communities Chamber of Commerce, in accordance with the challenge rules. Thank you for understanding!